In Giovanni Bellini's time, paintings of religious scenes were in high demand and none of these paintings were more influential and honored than the altarpiece. An altarpiece was (and still is, in many Christian churches) a painting or other form of art depicting a religious image that was displayed behind the altar where worshippers would be able to gaze upon it while listening to the service. 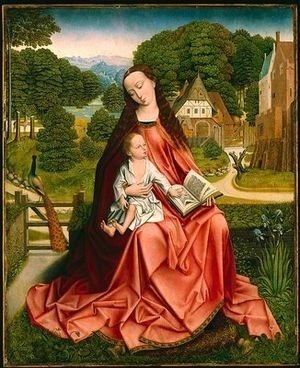 Earlier examples of altarpieces were typically comprised of two or three or more wooden panels, referred to as a diptych, triptych or polyptich respectively. Each of these panels would house one or two holy figures with the central panel (if there were more than two) displaying a somewhat larger or more grand image - often Jesus in glory or the Virgin Mary. Bellini's San Giobbe Altarpiece, however, was painted on a single panel, reflecting the newer trend toward the style of the sacra conversazione, or holy conversation, which was becoming increasingly popular. The idea behind the sacra conversazione was to have the Virgin and Child in fellowship with a collection of saints, as if they are holding court. Usually, no actual words are exchanged in the image through captions, nor are mouths open as if to speak, but rather the sacra conversazione takes place silently, as if the saints are in awe of Mary and the baby Jesus. 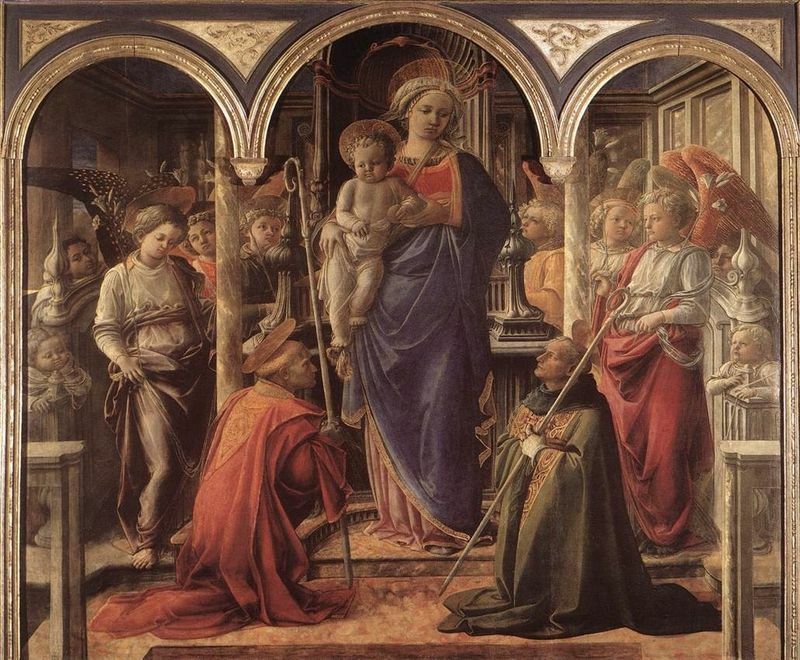 Fra Filippo Lippi's Barbadori Altarpiece is believed to be the earliest dated example of sacra conversazione. 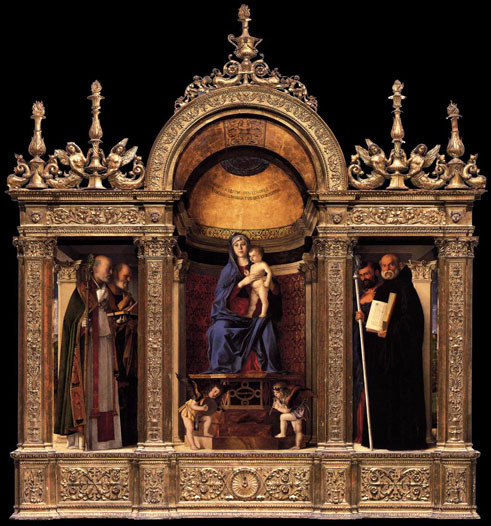 Although no definitive records exist, research strongly suggests that Bellini was commissioned to paint this altarpiece by the Confraternity of St. Job in Venice around 1480. This particular confraternity was dedicated to honoring St. Job (San Giobbe in Italian) and had created a hospice for plague sufferers. The hospice was later converted into the church of San Giobbe. 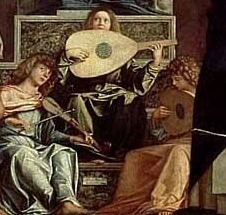 Bellini, who had developed a glowing reputation by the middle of his career, was probably asked to create an altarpiece that honored St. Job and included other popular religious figures. Bellini chose to include, along with St. Job and the Virgin and Child, a band of three angle, St. Francis of Assisi, St. John the Baptist, St. Dominic, St. Sebastian and the Franciscan bishop Louis of Toulouse. As with most sacra conversaziones, the scene depicted is one Bellini envisioned and arranged, rather than a collection of figures that actually had at one point convened. Rather, these figures were most likely chosen by Bellini to represent ideas and values that catered to the Venetian mindset during the early years of the Renaissance, as well as to meet popular demand. Bellini positioned St. Job closest to the Virgin Mary and baby Jesus at their right side - the place of highest honor. St. Job is a figure taken from the Old Testament of the Bible and was credited during the fifteenth century for assisting victims of the plague, since he himself had been afflicted with painful plague-like boils. According to the Old Testament, Job was a deeply pious man, who strove to live a life that would honor God above all else. God was very pleased with Job and the life he lived and blessed him abundantly. Satan saw this and argued that Job was only devoted to God because of these blessings, and if the things he had gained were taken away, Job would turn his back to God. So, Satan decided to test Job's devotion to God. First, Job's children (three daughters and seven sons) perish and his possessions are destroyed when the roof of his eldest son's house collapsed while they were all gathered for a feast. Job and his wife survive and Job does not curse God for destroying his family, but rather goes into mourning and praises God, saying "What the Lord has given, the Lord takes away. " Then, Job himself is afflicted by boils. His wife urges him to curse God, but Job is steadfast and asks her, "Shall we receive good from God and not receive evil?" Job's friends conclude - based on their belief that good is always rewarded and sin is always punished - that he must have sinned against God to incite these punishments and they beg him to confess. But Job maintains his innocence and, although he doesn't curse or renounce God, he does question Him. God enters the conversation by pointing out that, as the creator, he has supreme dominion over his creation and is not necessarily subject to questions from his creation (ie. human beings). God has total freedom over his creations and uses Job's life as an example that, yes, bad things can happen to good people. He chastises Job for entertaining the notion that he could have proven his innocence before God but he commends him for his virtuous words and unwavering devotion. Ultimately, God restores Job's good fortune -delivering him three more daughters and seven more sons, doubling his wealth and presumably healing him of his boils.